Mendeleyevsk (Russian: Менделе́евск; Tatar: Cyrillic Менделеев, Latin Mendeleyev) is a town and the administrative center of Mendeleyevsky District in the Republic of Tatarstan, Russia, located on the right bank of Nizhnekamskoye Reservoir, 238 kilometers (148 mi) from the republic's capital of Kazan. As of the 2010 Census, its population was 22,075. It was founded as the selo of Bondyuga (Бондюга) in the 18th century. It was granted urban-type settlement status and renamed Bondyuzhsky (Бондюжский) in 1928. In 1967, it was granted town status and given its present name after Dmitry Mendeleyev, who visited the factory there. 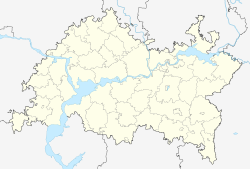 Within the framework of administrative divisions, Mendeleyevsk serves as the administrative center of Mendeleyevsky District, to which it is directly subordinated. As a municipal division, the town of Mendeleyevsk is incorporated within Mendeleyevsky Municipal District as Mendeleyevsk Urban Settlement. As of 1997, industrial enterprises in the town included a chemical plant, a bakery, and a fertilizer factory. Begishevo, the nearest airport, is located 50 kilometers (31 mi) south of Mendeleyevsk. The nearest railway station is Tikhonovo on the Agryz–Akbash line, 8 kilometers (5.0 mi) to the south. As of 1989, the population was ethnically mostly Tatar (48.5%), Russian (43.6%), Udmurt (2.4%), and Mari (2.1%). Государственный Совет Республики Татарстан. Закон №29-ЗРТ от 31 января 2005 г. «Об установлении границ территорий и статусе муниципального образования "Менделеевский муниципальный район" и муниципальных образований в его составе», в ред. Закона №137-ЗРТ от 30 декабря 2014 г. «Об изменении границ территорий отдельных муниципальных образований и внесении изменений в Закон Республики Татарстан "Об установлении границ территорий и статусе муниципального образования "Менделеевский муниципальный район" и муниципальных образований в его составе"». Вступил в силу со дня официального опубликования. Опубликован: "Республика Татарстан", №№18–19, 1 февраля 2005 г. (State Council of the Republic of Tatarstan. Law #29-ZRT of January 31, 2005 On Establishing the Borders of the Territories and the Status of the Municipal Formation of "Mendeleyevsky Municipal District" and of the Municipal Formations It Comprises, as amended by the Law #137-ZRT of December 30, 2014 On Changing the Borders of the Territories of Several Municipal Formations and on Amending the Law of the Republic of Tatarstan "On Establishing the Borders of the Territories and the Status of the Municipal Formation of "Mendeleyevsky Municipal District" and of the Municipal Formations It Comprises". Effective as of the day of the official publication.). Академия наук Республики Татарстан. Институт татарской энциклопедии (1997). Населённые пункты Республики Татарстан. Краткий справочник [Inhabited Localities of the Republic of Tatarstan. Brief Reference.location=Казань]. This page was last edited on 11 November 2017, at 23:59 (UTC).